One of the more standout features of Pacific Rim was the Special Effects in the CGI department. For many years I have consistently stated that Jurassic Park had the best Special Effects to date, even after Avatar was released. But now, for me anyway that has changed to Pacific Rim. Pretty much all of the Robot and Monster Scenes were CGI except for patches where it was more on a level with the human cast. The effects are most apparent in the Hong Kong fight. The effects used for the Giant Stars were not clumpy in their look or movement, they looked real and had a more fluid motion in what they did, be it punching or throwing or something else. The movement was most fluid though for the Kaiju as they are a more organic life form and when they moved it looked more like an animal than a big robot. The lighting also worked brilliantly with light not only bouncing off the Iron/Steel Jaegers, but also off the rain. The fire and water effects were lovely altogether even if the scene took place underwater, you could see what was going on clearly in a dark setting but it did not just look like some kind of blank void. When I went to see Pacific Rim, I went to see it in 3D. At first I was unsure of seeing it in 3D at first given my past experience with 3D films. I have previously seen a couple of films in 3D since this sort of new wave of 3D films. One was Up which featured two noticeable scenes where 3D was used and the other was the new Clash of the Titans where the only bit of 3D was in the trailers. When I went to see Pacific Rim however, the 3D effects actually worked. In this case though, there were almost no scenes that didn’t have a piece of 3D about it. From the start of the film where stars are moving around past your eyes, to points part way through when you could see a blue monster brain at the corner of your eye, and it felt like it was right next to you. While 3D does seem to be diminishing, Pacific Rim shows that it can be done properly and effectively providing that the production team work to do it effectively. Current 3D presentation at best is when it is a frequent occurrence in a film and not just every (Unnoticeable) now and again as well as pulling off the right effect. A great lot of work has gone into the detail of the films main point, the Giant Robots. Shortly before the film’s release, Legendary released a couple of videos showing off how the team went on about designing both the Kaiju and the Jaegers. The Jaegers do have a look about them which is reminiscent of the machines seen in Japanese Anime but are not copies of them. To me, the designs look a lot like the Megazords from Power Rangers and Super Sentei as they do have a human look to them. A surprising amount of detail has also been added to the smaller parts of the machines as well. It’s as if the producers of the films designed manuals for each machine as if they were actually built. The design of each Jaeger also have a sense of steam punk about them as they do look very industrialized while also showing off some connection with the country they come from. The American machine (Gipsy Danger) is very tall but does not look lumbering and is clearly designed for good old hand to hand combat, something it shares with the Australian Jaeger (Striker Eureka) while the Chinese Jaeger (Crimson Typhoon) on the other hand is more like a lumbering brute but has a martial arts sense about it with its combat style, spinning blades and its three arm advantage and one eye look makes it look menacing. The Russian machine (Cherno Alpha) meanwhile is an ancient machine and looks the part; this in turn is represented by its style which looks more like it was designed for defence first with its big head and then attack second with the idea that strength is everything. The Kaiju in comparison are more animal like. The Kaiju have many traits about them which relate to those of animals in the real world. One of the early Kaijus looks like a Crocodile as well as a Goblin Shark, while the big bruisers later in the film are more like Gorillas while keeping a reptilian appearance. This gives the big monsters their own independent look instead of just randomly produced or just the same creature over and over again. When designing the Kaiju monsters, the production team tried to make their appearance similar to those of Japanese Kaiju films with the idea being that you have to imagine a man being inside the creature, like a Monster suit. This is achieved brilliantly and makes the fight scenes, while completely CGI, more fluid in their fighting and more believable as result. The slightly humanistic look of their fighting styles also raises tension due to the uniqueness of it and less animal like which is more random. The more animalistic part of the Kaiju comes into it when they are moving about and stomping/crushing on buildings. Like the Jaegers, the Kaiju have had a lot of detail done to them on the smaller scale to including scales, the hands, wings, legs and arms and even more so to the face which includes emotions. It is also not the design of the creatures that have subtle hints towards Japanese Kaiju films, but also in the Kaiju theories. The Kaiju in the film are rated in categories depending on their overall size and power. This category system is named the Serizawa Scale which is a nice little tribute to the original Godzilla film as one of the characters in the film was named Serizawa. I think that’s quite nice. You may be thinking that with this level of detail for the monsters and robots that the human may have been shunned to one side in production. Well they haven’t, a lot of detail has been put into the human part with elements of Monster religion as well as other things. The main bridge for this is through the use of the Kaiju Black-market which also introduces these other elements as well as show off smaller elements about the Kaiju. Pacific Rim’s soundtrack (Produced by Ramin Djawadi) is one of the standout points for me personally. The soundtrack has a nice range of themes for such an epic scaled film with pieces that are best used when they are in a large open space to show the size and scale. The soundtrack though gets better on the human point of view when the Jaegers are in shot. The film’s main theme is used a lot when Gipsy Danger is in shot. it comprises of lots of brass sections with some electric guitars and gives a hero element to the machines, it shows that they are not just weapons, they are heroes. It’s just like if Superman or Batman were to arrive on scene, you know that things are a bout to change in the face of conflict, you feel safe and secure; something that the main theme for Pacific Rim does well. The best part of the soundtrack though is when the Kaiju are in the foreground. When you see the monsters, particularly during the Hong Kong scene the soundtrack gives out a loud low note or element. It is the kind of sound produced by heavy brass sections of an orchestra and traditional Asian drums. The soundtrack in this instance sounds a lot like a Japanese Kaiju film. In professional wrestling there is a wrestler known as The Undertaker who has a very familiar entrance where the bongs of a bell can be heard before he makes his appearance. It is the same here but with a more traditional Asian feel. It’s the entrance of the Kaiju if you will, it gives them their own unique soundtrack from the rest of the film, and it feels amazing. It brought back moments for me of Monster films like The Host when the monster surfaces for the first time. But more than that, it felt a lot like a Godzilla film. Instead of just making a run of the mill Monster Movie, it showed the commitment and passion needed into making a Good Monster Movie. Pacific Rim also did something extra special which is not done as regularly as it should be done in Cinema. Many films these days have an extra scene in the credits, a spoiler for a sequel usually or maybe just a funny extra scene. Pacific Rim however did not do this, it did something extra special. It had a dedication, a dedication to two of cinemas greatest film makers. The Late Great’s Ray Harryhausen and Ishirō Honda. That is something which does not happen a lot these days which is a real shame, they appear not to take time to say thank you to those who have helped to shape and build cinema by doing things that captured the eyes of those that they entertained. Ray Harryhausen is of course the Special Effects master who produced many Monster Movies including The Beast from 20,000 Fathoms and the original Clash of the Titans. Ishirō Honda (my Favourite Director) is the man who produced many Japanese Kaiju films with films like Atragon and Mothra but was best known for his work in the Godzilla film series as the director of 8 films in the series including the original 1954 film. Pacific Rim is a fitting tribute to the careers of these two Amazing people. Pacific Rim is an Amazing film. I am so pleased that Travis Beacham proposed the film in the first place and that Guillermo del Toro joined the project, because if they didn’t, we wouldn’t have had this Amazing film. Films of this scale and size are rarely produced these days, which is a real shame, because they are absolutely incredible. But Pacific Rim does show films like these and Monster Movies in particular still have the power to WOW audiences of all ages and can adapt without losing their integrity. It is now less than a year to go until Legendary Pictures release their new Godzilla film, so while we wait for that, we have another Amazing Monster Movie to enjoy here and now. Pacific Rim is the best film so far this decade. GENEPOOL (Pacific Rim is practically perfect, there is only one thing that the film is missing). It has been consistently evident in Monster Movies that the human race is powerless in attacking Giant Monsters. If you take a look at any Godzilla film (except for the obvious one) that Tanks, Planes and even weapons in general come off second best against the monsters. It is more likely that Tanks will be crushed or in some cases melted against the might of the monsters. In many cases outside the Godzilla series, more ingenious methods have had to be employed in order to achieve victory. Some examples of this include Atomic Isotopes (The Beast from 20,000 Fathoms), Freeze technology (Atragon) and even traffic poles (The Host). One of the more suitable options though would be to build weapons as big and as powerful as the monsters. However, though this idea has not really been implemented as often as you’d think (Except for 5 Godzilla films and 1 King Kong film). 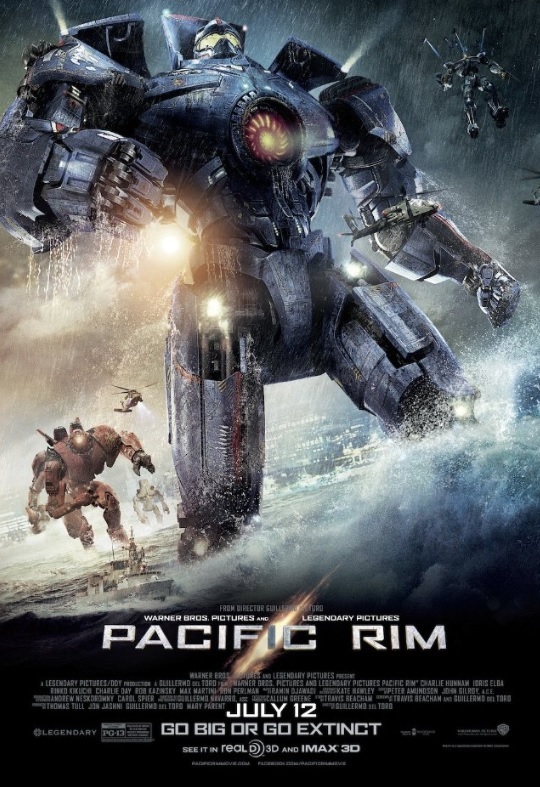 However that may change as Pacific Rim does that, and it seems to work very effectively. I have known about Pacific Rim as a film for well over a year now, but my discovery of it was mostly by accident as I was looking up the actor Idris Elba. After reading up on the idea, I was hooked but it was not until this past December when the first trailer was released just before the End of the World. The trailer looked Amazing, the scale, the beauty, the machines and the monsters. Every now and again I would watch the trailer again and again until the next trailer was released. As the film approached its big release, more and more stuff was announced, then it came to a point when I saw the film on opening night, in 3D, and the first thing I want to say after you have read that is that this is the first, proper good new wave 3D film. But I also want to say this; Pacific Rim is the best film so far this decade. The film does not waste any time getting into the main plot and opens with an introduction from the films lead character Raleigh Becket (Charlie Hunnam) describing what has happened in recent years. The monsters called Kaiju came from a large portal called breach at the bottom of the Pacific Ocean. The first Kaiju appeared in San Francisco and it took 3 days to kill it. But a few months later another one shows up. In response weapons are built to combat the colossal creatures, Giant Robots called Jaegers, giant robotic fighting machines, and eventually the human race starts winning. Raleigh Becket is a co-pilot of one of these machines as the neural processes required to use the machines cannot be done solo. He is dispatched to fight a Kaiju in Alaska in his machine Gipsy Danger. However things don’t work out, he loses his co-pilot (also his brother) and beaches his Jaeger in Alaska. Five years later faith in the Jaegers is starting to dwindle due the experience of the Kaiju with the machines gets better and so a Wall is being built to protect humanity instead. Becket works on a section of the wall when Stacker Pentecost (Idris Elba) who runs the Jaeger Program asks him to return to active duty. The Jaeger program and all remaining Jaegers are moved to Hong Kong which has no current Wall section. In Sydney a Kaiju attacks and breaks through the wall in one hour. The creature is subdued by one of the best Jaegers despite it being moved to Hong Kong. Becket is introduced to Mako Mori (Rinko Kikuchi) who is in charge of putting Gipsy Danger back together after what happened. Pentecost has a plan to destroy the rift that the Kaiju use with an “Acquired” nuclear weapon. The only problem for Gipsy Danger is that it needs a co-pilot. Mako really wants to do it but Pentecost does not allow her. While Becket tries to find someone to be his pilot, one of two scientists named Newton (Charlie Day) links up his brain like the drift for the Jaegers with a Kaiju brain to try and work them out. While this angers his colleague; Gottlieb (Burn Gorman) it is somewhat successful. After a lengthy process, Pentecost allows Mako to co-pilot Gipsy Danger and the start-up test sequence for Gipsy Danger appears to go well until one of Mako’s memories goes haywire and almost destroys the base. Gipsy Danger is grounded for the time being. Newton goes into Hong Kong looking for the head of the Kaiju Black-market, Hannibal Chau (Ron Perlman) to try and get another Kaiju Brain. All of a sudden, two Kaiju appear to attack Hong Kong. The Chinese and Russian Jaegers are put into action with the better Australian Jaeger put on defence of the city as it is vital to the plan to destroy the rift. Very quickly both the Chinese and Russian Jaegers are knocked out and the Australian machine goes into action only to be disabled. Gipsy Danger is deployed while Newton goes into a shelter only for the Kaiju to find him thanks to the connection he made with a Kaiju Brain. Gipsy Danger is successful in defeating both Kaiju and Becket and Mako are cheered as heroes. In Hong Kong, Newton and Gottlieb manage to get inside the Kaiju brain and learn more about it and how the plan to destroy the breach needs to happen in order for it to work. Before they can properly relay the information, the plan goes into action with only Gipsy Danger and the Australian Machine. When they arrive at the breach they are attacked by two Kaiju and an even larger Kaiju. The Australian machine sacrifices itself to allow Gipsy Danger to get inside the breach unopposed. Newton and Gottlieb relay the information for the plan to work properly. This is achieved and Gipsy Danger falls through the rift allowing Beckett to set off the nuclear reactor powering the machine to destroy the rift. He along with Mako manage to escape from the machine before the explosion goes off. The film is of an epic scale that you just don’t see with many films these days. The size of the content and setting plus the story is huge to say the least and it is all brought together by Legendary Director Guillermo del Toro. He has built an incredible world of Monsters and Robots while also keeping it altogether and not exploding into one big mess. The film contains traits of great monster movies from the past while also doing something completely original also. The film’s special effects also work alongside his artistic style of film making. The amount of detail that has been made for just this one film shows his passion for both cinema and the Monster Movie Genre. Not only would it be interesting to see a sequel to this film, but also see him direct another Monster Movie. The film’ cast are an interesting point. In the past, when it comes to mainly American Monster Movies, notable actors of the time would be asked to appear but the acting would be moderate at best with most of the fame and attention going to the monster and little to the personal lives of the films characters. Pacific Rim does not do a reversal of this but more includes them on a more even standing with the monsters. 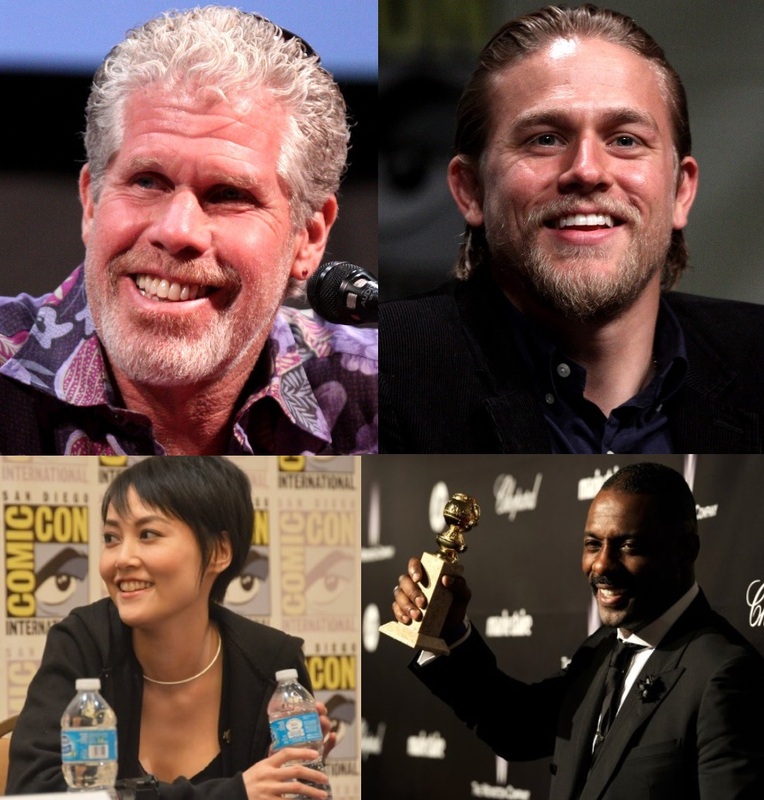 Like the old American films, notable cast members are included in the film such as Idris Elba (The Wire, Prometheus and Luther), Charlie Hunnam (Cold Mountain and Sons of Anarchy), Ron Perlman (Sons of Anarchy, Blade II and Hellboy) and Rinko Kikuchi (Babel and the upcoming 47 Ronin). Beckett is someone who is trying to live with the consequences of bad choices made as his time as a pilot, while Mako is trying to distance herself from a horrible memory, one that almost causes chaos. The drift mechanism is a great way to introduce and show characters their personal lives as one thing could expose a horrible past. Pentecost is an amazing leader who is trying desperately to protect Mako, the reason why is later revealed but is trying to do this in a not so strict way becoming her adoptive father, but deep down he too is trying to hide something, he also presents one of the film’s best lines. The other main pilot characters are a nice mix also but it is interesting to see how the Australian pilots almost act like tough, rough Americans but this adds to the tension one poses between him and Becket. While many of the other pilots are pretty much silent throughout the film, they do show their personalities from several different ways including how they walk as well as fight. Newton (who to me looks like J.J. Abrams) and Gottlieb are a couple of stereotypical science nerds who bring a lot of humour to the film but are also an integral part also and not complete jokes. Hannibal Chau is one of my Favourite characters overall. While he holds the stance of a crime lord, Perlman plays the character in a similar style to Hellboy (Directed by Pacific Rim Director Guillermo del Toro) without becoming Hellboy. His scenes offer a sense of humour about them but also allow time to be serious. Returning to Mako briefly, her character begins almost like a scientific receptionist but turns into a warrior after she begins to pilot the Jaeger, much like someone growing up, you grow up with her as the film progresses and she becomes one of the best characters in the film. Her flashback scene contains a lot of emotion in her and it is a scary scene and you feel for her during it. While she is younger at the time, the young actress (Mana Ashida) is amazing and shows real human emotion, not just fake screaming or anything of that sort, but actual terror and fear. The sets are brilliantly designed with a large amount of scale and size depending on where things are. One of the most detailed set features is the cockpits for the Jaegers which have a lot of similarity in them which show how the machines became standardized in construction techniques over time, but each separate identity of Jaeger has its own independent features. Also when the Jaegers experienced issues inside the control room, you would see the flames and water gushing all over the place and in some cases you would feel the shaking about thanks to clever use of the camera work. GENEPOOL (Click Here for Part 2).